Jar cakes are the best when you want a little dessert and are too tired or impatient (or both, like me) to make a complicated recipe. 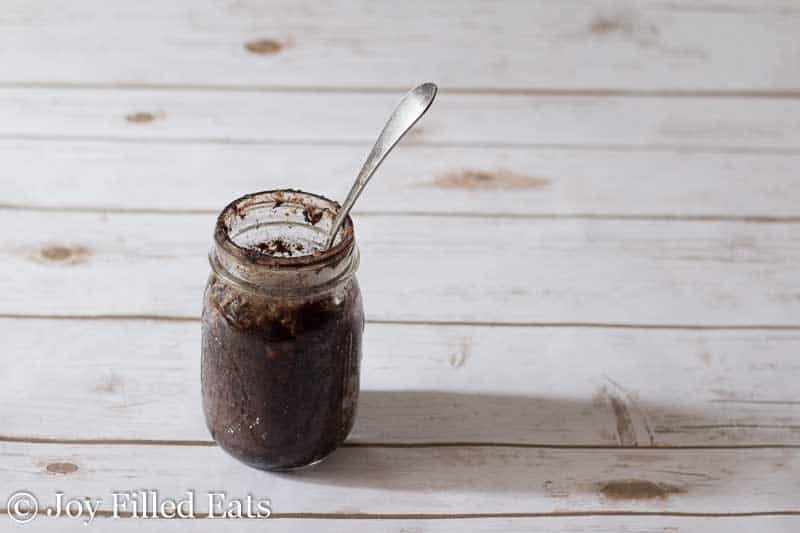 Dump some ingredients in a jar, shake, microwave. Eat. The only problem is that for a food blogger they really aren’t that pretty to look at. You just have to trust me on this one. 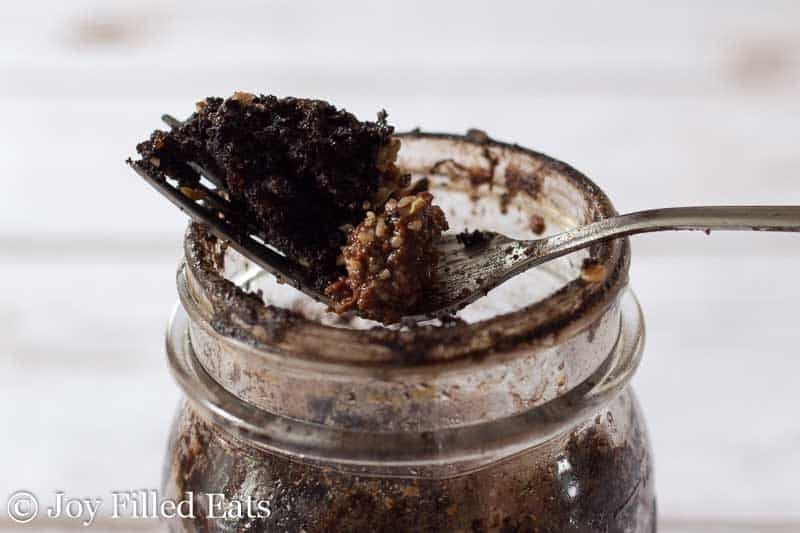 This Chocolate Pecan Mason Jar Cake is dark and rich and the icing is closer to a truffle than a frosting. I ate this for lunch with no guilt or regrets. The cake itself is dairy free. The truffle icing has milk chocolate in it but you can easily substitute dark or unsweetened chocolate. You will need to increase the sweetener to taste. 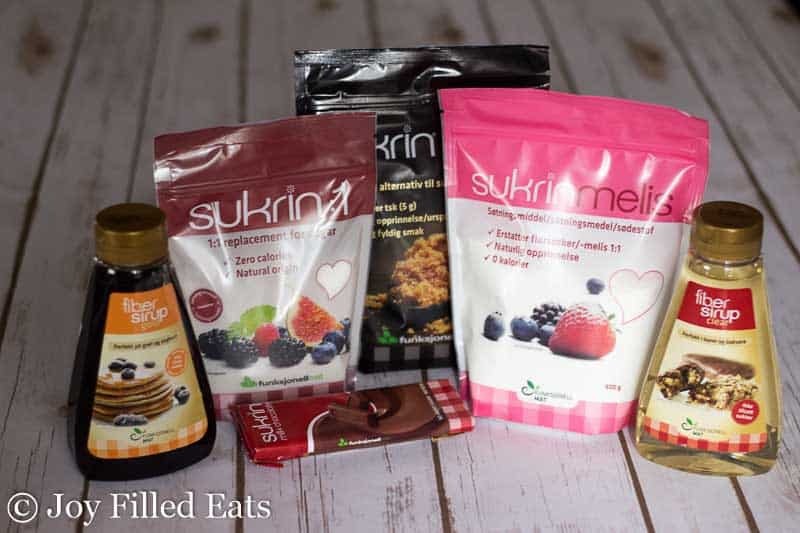 Speaking of sweetener, Pernille at Sukrin sent me some of their products to try and to share with you. Unfortunately, not all of the products are approved for Trim Healthy Mama but they are all sugar free and low carb. The Sukrin:1 and Sukrin Melis are both fine for THM because they ingredients are erythritol and stevia. And the chocolate. The chocolate is approved. Hooray! I’m always on the lookout for good on plan chocolate. I really like the flavor of both of the sweeteners and the chocolate. The sweeteners measure 1:1 to replace sugar without an aftertaste or any bitterness. I’m excited to try them in more recipes. The chocolate is smooth and creamy. I really liked the Milk Chocolate with Almonds and Sea Salt. The Fiber Syrups and Sukrin:Gold are not on plan for THM but are low carb. I do want to experiment with them a little still. I asked a THM admin who said that the syrups would be ok to use instead of vegetable glycerin in ice cream. That would be 1 tablespoon for 3-4 pints of ice cream. I’m curious to see if they would accomplish the same thing that vegetable glycerin does: keeping ice cream soft and scoopable. I’m planning on making an apple pie ice cream very soon. That was my favorite Ben & Jerry’s flavor ever and they sent it to the recipe graveyard years ago. If your coconut oil is solid add it to a pint sized mason jar and microwave for 20-30 seconds until it reaches a liquid state. Add the other ingredients to the jar. Put the lid on and give it a good shake. Remove the lid. Microwave for 2 minutes. To make the optional topping: In a small bowl microwave the chocolate and coconut oil until melted. Stir in the sweetener and pecans. Spoon on top of the cooked mug cake. It will be thick like a truffle. I'm just wondering, why is the syrups not on plan? Did an admin weigh in on why they are off plan? Thanks! I'm concerned about one step to your instructions. Your instructions say, "Put the lid on and give it a good shake. Microwave for 2 minutes." You do not mention taking the lid off of the jar, and most mason jars have metal lids, so no microwaving them. You did not mention if the jar needs to be covered or if the lid needs to be removed, and there are those who just might need to know that metal cannot be microwaved. Yes, please don't microwave the metal lid. You need to remove the lid before microwaving. I'll add that to the directions. Thanks. so what would be the substitutions for the sukrin? i'd like to try this recipe, but i'm not sure how much of either sukrin product to use. i have thm super sweet and gentle sweet, as well as erythritol, xylitol, and stevia separately. Sukrin measure 1:1 to sugar I believe. If you aren't opposed to tasting the batter I'd use half the amount of gentle sweet and give it a taste. Gentle sweet is twice as sweet as sugar. Mug cakes are so fast and easy to make! 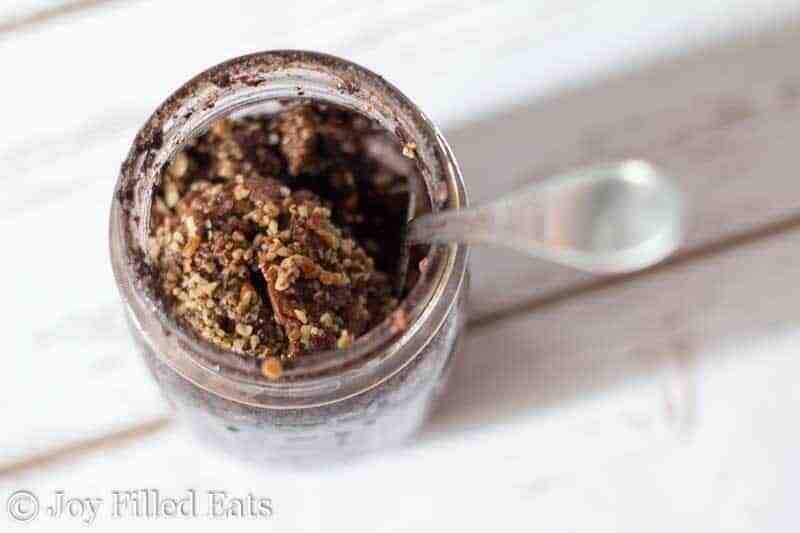 Perfect for a quick chocolate craving! 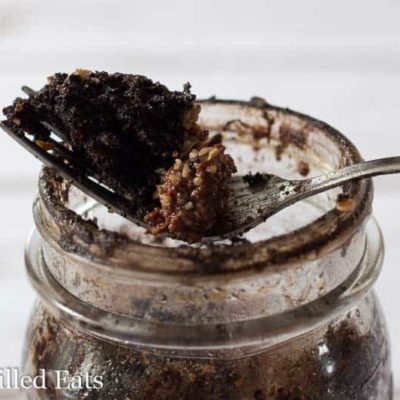 Wow this jar cake looks SO chocolatey and rich! Sukrin make great sweeteners. I have not tried the fibre syrup - wonder if I can get it in Europe? And don't worry about how this cake looks - we all know that the stuff that isn't too handsome always tastes the best! It sounds absolutely delicious. Oh I love treats in a mason jar! This looks wonderful and I need to try these Sukrin products.